Have you entered the dungeon of daily? The expression, “There’s light @ the end of the tunnel,” offers no hope when the tunnel feels like a circle with no end. Years ago, I entered a dungeon of daily. Chris experienced a break from reality. His mind raced. He spoke nonstop and paced the floor. The doctor prescribed medication to help stabilize him. After two months, we could have a conversation with him. The medicine worked. But, we still had no idea what caused the psychotic episode. The next several months consisted of weekly visits with a psychiatrist. During the day, Chris exhibited unpredictable behaviors. One minute he’d sob, “Why? Why is my life shattered?” The next minute, he’d pound his fist through the wall. Eventually, Chris needed to be hospitalized. He received full time treatment in a psychiatric ward at our local hospital. Partial-care treatment followed. After that, homebound instructors visited our home. Through it all I wondered, Will life ever be normal again? What does the future hold for Chris? How long can I go on like this? I held onto the promise that God would never abandon me. I looked for Him in my endless tunnel. And found Him in many ways. God protected us from literal harm during Chris’s violent outbursts. My heavenly Father revealed His presence to Chris in the psychiatric ward through a nurse—a fellow believer. He gave me perfect peace in the midst of great sorrow. Dealing with mental illness can make us feel like we are being swallowed up alive. Living a dreary existence. Stuck inside a never-ending pit of uncertainty. But that’s not the truth. We may not know what our future holds, but we know Who holds the future. We can be certain of His presence in our darkest times. There is light in the tunnel. The Lord turns our darkness into light. He’ll guide us through the tunnel. 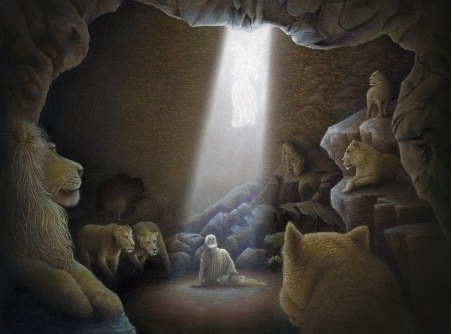 The same God who protected Daniel in the lion’s den will protect us. The same Lord who walked with Daniel’s friends in the furnace will walk with us. The same Father who heard Jonah’s prayer in the pit of a big fish will hear our prayers. How has the Lord turned your darkness into light? ← What’s it like to raise a child with mental illness? I’ve learn this publish and if I may I desire to suggest you some interesting issues or suggestions. You can find more similar messages containing my personal story starting April 16, 2014. I’m sure you’re not the only one who wants to be happy again. Many moms raising kids with mental illness yearn to be happy. But that seems like an impossible dream when life is so challenging and unpredictable. The good new is that we can all experience the joy of the Lord. When we accept Jesus as our Savior His Holy Spirit dwells inside us. Thankfully the fruit of the Spirit includes joy.